After a year full of beauty brands’ promises of grandeur and miracles, College Gloss is here to give you a detailed guide of the best in skincare. We haven’t left ANYTHING out! Remember, beauty doesn’t have to be expensive, just smart. 1. 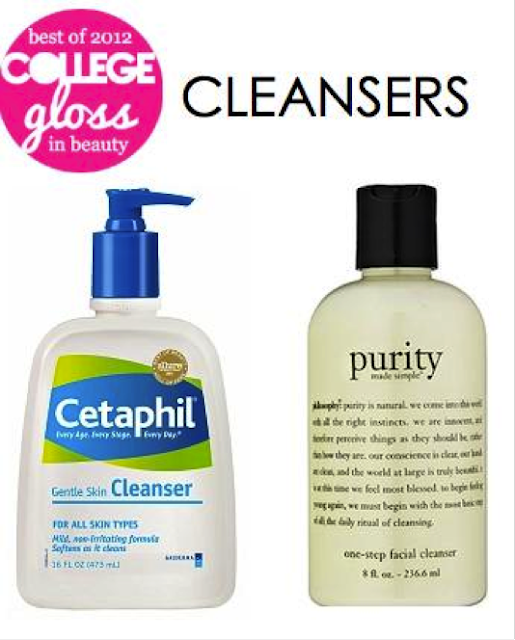 Cetaphil’s Gentle Skin Cleanser ($9.29, Target) is one of those products that everyone, from beauty editors to dermatologists, swears by. It is sensitive, and you can use it even if you are also using acne medication or other topical creams. And, if you are wondering, this gentle formula will remove your stubborn waterproof mascara. It’s a win-win. 2. Philosophy’s Purity Made Simple ($19, Beauty Bar) is perfect for all skin types. And it removes every drop of makeup on your face, from that annoying lash glue to your favorite eyeliner! Not every cleanser that is gentle enough for any skin type can also fully remove makeup like this one. Oily/Combination Skin: Clinique’s Dramatically Different Moisturizing Gel ($25, Nordstrom) has been a holy grail product for women between the ages of 13 to 50 for some time. Many customers have praised this baby for its lightweight, moisturizing quality. Its sensitive formula has been a go-to moisturizer for those with the most sensitive and acne-prone skin. Give it a try, and tell us what you think! We promise you will not be disappointed. This is a CG all-time favorite. Dry Skin: Dry-skinned ladies: we know, we know, all those YouTube gurus and beauty editors seem to ignore your needs. There is an excessive amount of information on oily/combination gals, but few details on your skin type. 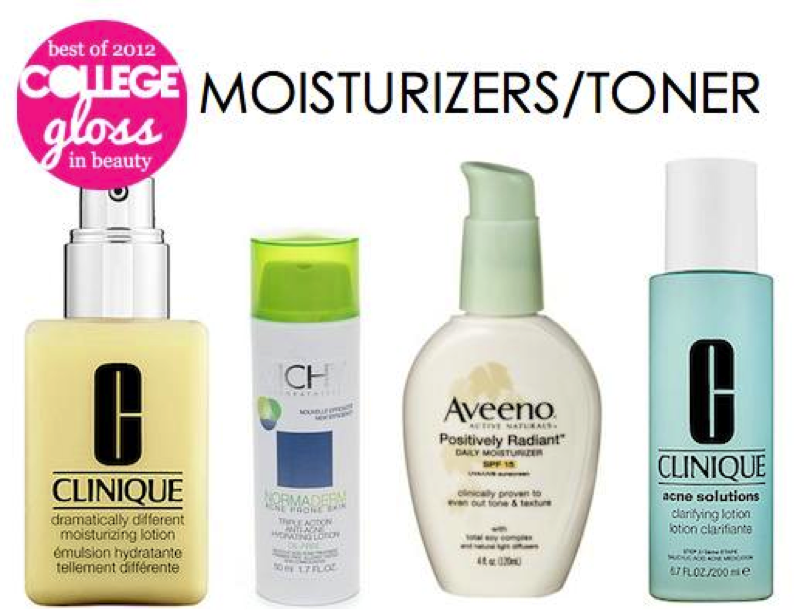 We recommend Clinique’s Dramatically Different Moisturizing Lotion ($24.50 Nordstrom). A bottle of this is sold every 4 seconds, that’s how good it is! Acne-Prone Skin: We highly recommend Clinique’s Dramatically Different Moisturizing Gel ($25, Nordstrom) for acne-prone skin, because of its sensitive formula, but if you are looking for a more aggressive treatment, try Vichy NormaDerm Triple Action Anti-Acne Hydrating Lotion ($23.50, drugstore.com). We don’t mean to gush, but this product is truly magical. Results are visible within three days after use! This magic potion will unclog your pores, clear your blemishes and blackheads, all while controlling your oil production. Normal Skin: For you lucky ladies who have pretty normal, flawless skin and deal with just a few breakouts a year, your only priorities are to moisturize and religiously apply SPF. The best fit for your balanced skin is Olay Original Active Hydrating Beauty Fluid ($6.79, Ulta). A true classic, don’t be surprised if it was your grandmother’s favorite moisturizer. It is extremely lightweight, and your skin will absorb it effortlessly. Tied with Olay is Aveeno Positively Radiant Daily Moisturizer SPF 15 ($13.59, Amazon) for SPF protection. Do not make the mistake of buying a pricey cream when these moisturizers do the job! Plus, they both make for a great base under makeup. Sunscreen: Our top sunscreen pick is Neutrogena Healthy Defense Broad Spectrum SPF 50 with Helioplex ($10.31, Amazon). If you are looking for a lightweight moisturizer that will not irritate your sensitive skin AND has SPF, this is for you! And, you can’t beat the price. Helioplex was designed by Neutrogena: “The sunscreens in Helioplex™ further protects skin by absorbing and transforming UV light into a harmless form of light," says the Antiaging-wellness website. Oily Skin Toner: Clinique’s Clarifying Lotion #4 ($12.50, Nordstrom) is the champ! This will aid in unclogging your pores and controlling shine! After a few weeks, your complexion will be smoother and cleaner. 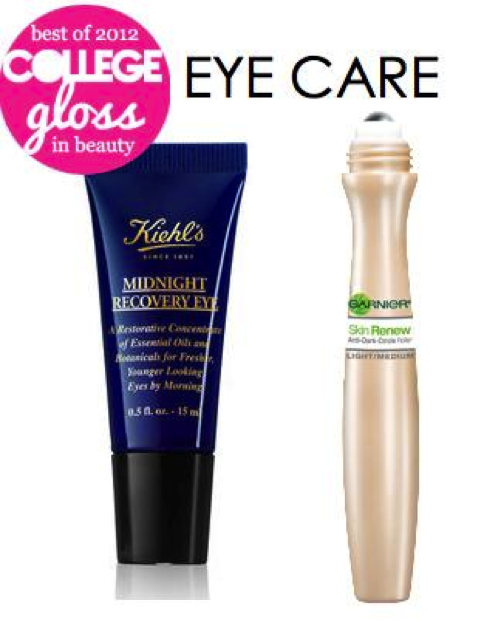 Dry/Puffy/Fine Lines: If you have super dry eyes that require extra attention, pick up Kiehl’s Midnight Recovery Eye ($36, Kiehls). This is a super hydrating formula with all-natural ingredients that decreases fine lines, dryness and puffy eyes by the crack of dawn! Try it out, we promise it will not disappoint! Everyday: Garnier Anti Dark Circle Roller ($15.99, Amazon) is a great pick-me-up in the morning, is super lightweight and does the job! Note that this is not enough coverage for extreme dark circles. 1. 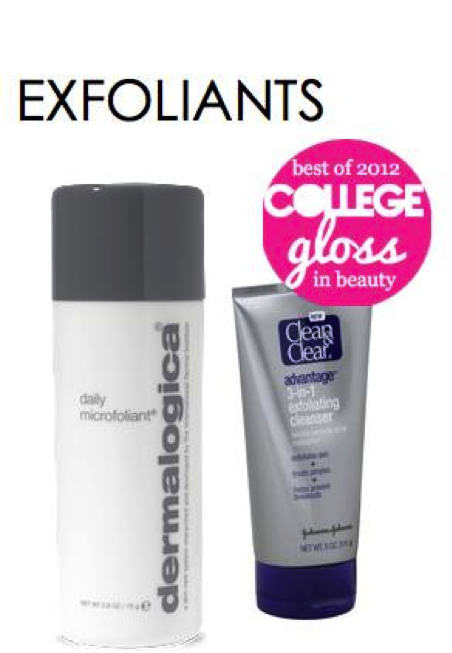 Our favorite pick for everyday upkeep is Dermalogica Daily Microfoliant ($40, Beauty Bar). This is appropriate if you are searching for something gentle to help the texture of your skin. Ladies, if you are someone who suffers from an oily T-zone and a few minor bumps, spoil yourself and indulge in this luxury product! It is also great for our girlies who suffer from acne, as it contains salicylic acid, and its rice enzyme component helps with the restoration of your skin! 2. Clean & Clear’s Advantage 3-in-1 Exfoliating Cleanser ($6.29, Amazon) is another winner. “The microbeads help loosen blackheads, but they’re smooth and won’t scratch your skin, and the benzoyl peroxide kills acne-causing bacteria,” according to WebMD. Any girl who tries this will be sure to swoon over its ability to exfoliate and slough off dead cells. CG’s favorite pick is Boots No. 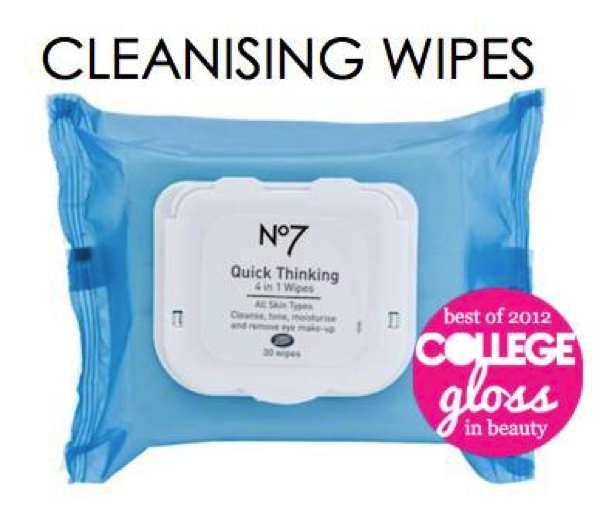 7 Quick Thinking 4-in-1 Wipes ($11.95, Amazon). These refreshing towelettes clean your face, remove makeup, exfoliate, tone and moisturize all in one swipe. It even suits all skin types. You will be hooked once you try it! Oily: We love, love, love Freeman Feeling Beautiful Dead Sea Minerals Facial Anti-Stress Mask ($3.99, Ulta). Wow, that’s a mouthful, but it seems like it was custom made just for college girls! It will draw out your impurities and instantly makes your skin feel soft! 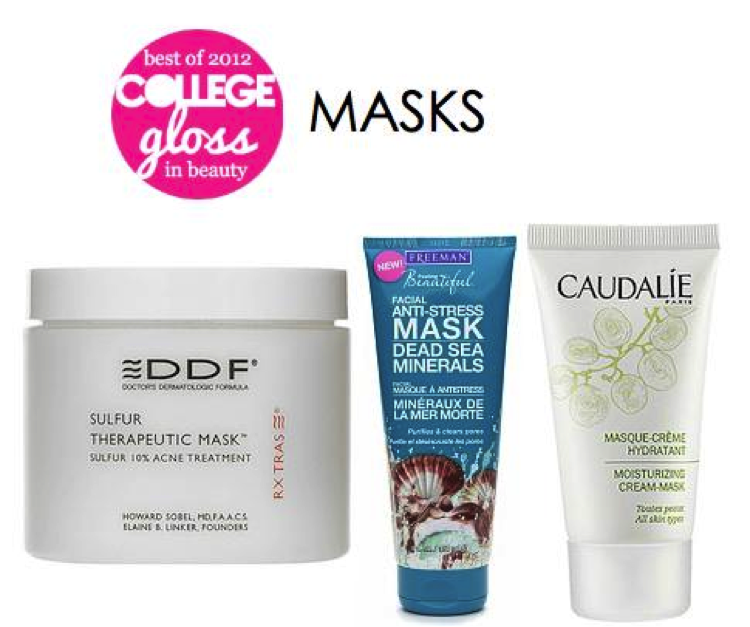 Acne-Prone: DDF Sulfur Therapeutic Mask ($38, drugstore.com) is one of our ultimate favorites. This mask does not dry out your skin, just your active breakouts. It has the special ingredient of sulfur. Sounds scary, but it’s super effective. Dry: We have all read about the wonders of honey and oatmeal for dry skin, but if you are not a “DIY” kind of girl, we recommend you check out Caudalie Moisturizing Cream Mask ($40, Sephora). For you ladies with dry skin, it makes sure your skin receives enough moisture over time; it doesn’t happen overnight. After this extensive list of the best-of-the-best in skincare, we propose that you become an educated consumer. Do your research! All these products are amazing, but remember, not everything works for everyone. We are all individuals with unique skin types and different levels of sensitivity. Have fun with our guide, we truly hope it helps! 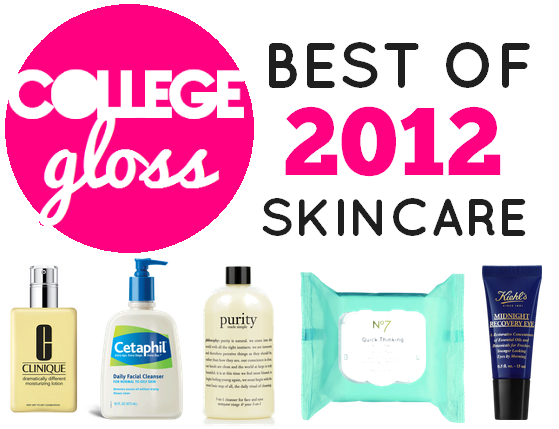 Check back throughout December for College Gloss’ Best of 2012 beauty series! Next week, we’ll give you our picks of the year for bath & body. Thank you for this post! You Habr NO idea how hard it is to find good advice on combination skin! My skin is so temperamental, I am definitely going to try the clinique moisturizer! This is great! I've always wondered if some of these products actually worked and now I know. I trust Ivanna's savvy eye for style and now beauty products! Can't wait to buy the Garnier Anti Dark Circle Roller!! they should really link the other lists at the bottom! that would be so helpful!! thankss!! It’s good thing that you have a routine skin care treatment.